I take a sidelong approach to a lot of the newsgroup tools I try. Many of them seem well-thought-out, and are no doubt of considerable use to the people who rely on them. 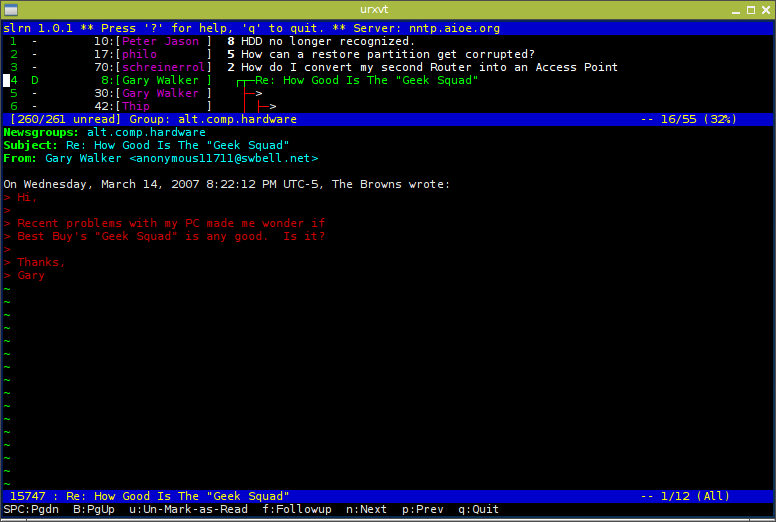 But newsgroups on the whole tend to disappoint me, so a lot of the usefulness is a side note. nget is probably a good example of that. 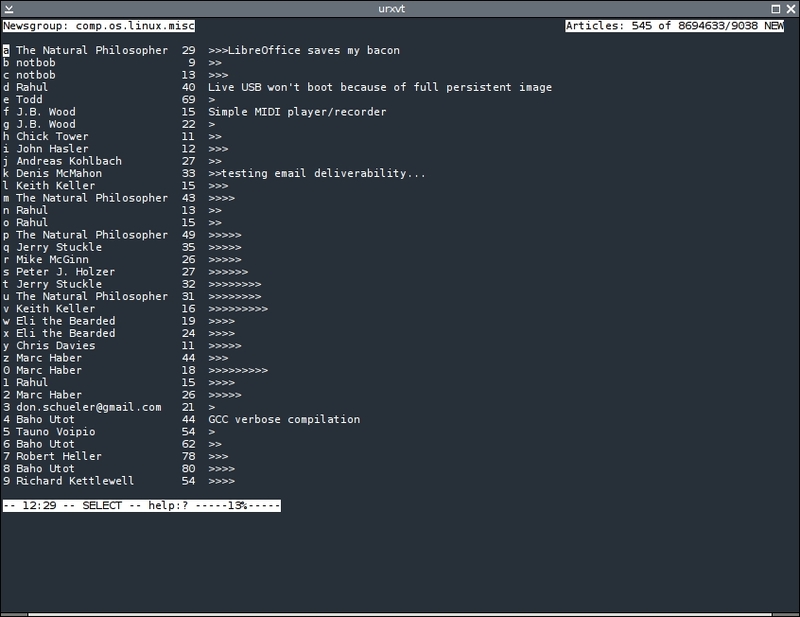 As a straight-shot command line tool, I have no doubt it does marvelous work for some people. 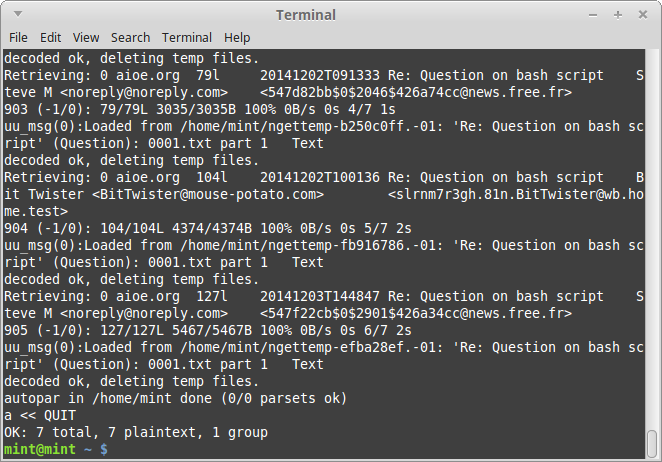 It hammers out the job in a very old-fashioned, traditional way, with an .nget5 folder holding an .ngetrc file that needs to be edited with the name of a news server (I used news.aioe.org again, and had no problems) before it will run. Then you have a long list of flag options for nget, depending on what you want it to do — download unread messages, pull in attachments based on a name filter, or whatever you like. In that sense, it’s very very flexible. But from where I sit, it’s not very exciting. You can see some of its output in the images above, and that plus error messages or connection reports seems to be all it will tell you. I could expect more, but that’s where my general disinterest in newsgroups starts to kick in. Perhaps you’ll find it more interesting or useful than I did; in any case, I can vouch for it working acceptably, and as promised. But if you’re looking for something a little more interactive, a little less cryptic and maybe even a little more colorful, there are other tools available that can simplify the newsgroup experience. Keep an open mind. After all, sometimes a hammer is just a hammer. And sometimes what you want and need … is a hammer. This entry was posted in Linux and tagged client, news, newsgroup, reader, usenet on 2015/02/01 by K.Mandla. Last time I tried nn, I got a succession of messages telling me my NNTP server could not be found, and so I took it as a sign that either (a) my configuration was all screwy, which is usually what happens; or (b) that nn was just too far gone to be useful any more. Luckily, thisnameisfalse gave me a hint, and now I have something to show for my efforts with nn. And from there, gravity took over. 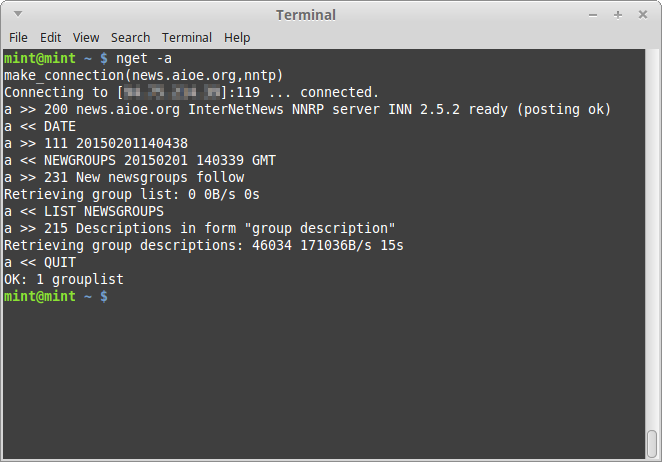 😉 The irony of course, is that the installation warning for nn mentions setting the environment variable to your news server. So either I wasn’t paying attention, or I didn’t catch the warning. Mea culpa, either way. The second irony is that after installing it and trying it out, nn falls very short of other usenet readers, in my humble opinion. nn can’t really stand up to slrn or tin, for that matter. Sadly, I found nn to be a lot less intuitive than either slrn or tin, and I needed to bounce to the help page at almost every action. As with any program, I am sure I could learn the requisite commands if given enough time and experience, but compared to slrn or tin, where I was up and reading within minutes, nn is less obvious. I will give nn some points for being lightweight; pacman -Qi puts the nn package at a meager 685Kb, which is roughly what Debian measures it at, plus some documentation. That might not sound light, until you realize that tin is roughly three times that, and slrn is a whopping 2.4Mb. If you trust pacman -Qi, that is. This entry was posted in Linux and tagged news, reader, usenet on 2014/08/12 by K.Mandla. 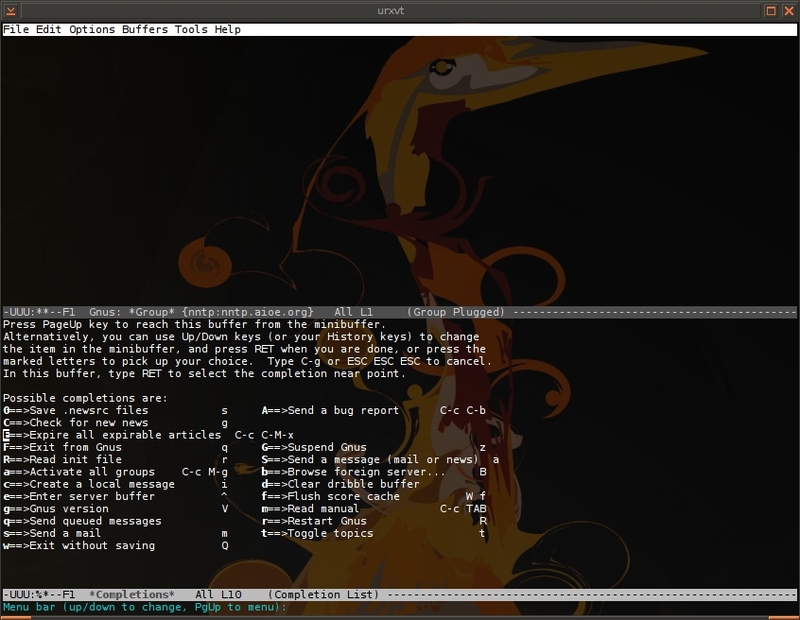 I feel a little disappointed in myself: This is the best I did with emacs‘ built-in newsreader-plus-e-mail-client, gnus. I feel I should mention that if you just search the Internet for “gnus setup”, a large portion of your results will be how to make gnus play nicely with GMail. I didn’t go in that direction, mostly because I had gnus in my notes as a newsreader, and I was interested in seeing how it compared with slrn and tin. This entry was posted in Linux and tagged client, e-mail, news, reader, usenet on 2014/07/21 by K.Mandla. I’ve tried just about everything I could think of but trn eludes me. This is the best I saw from it. I tried the AUR rendition, to include the added step of sourcing the heimdal profile. 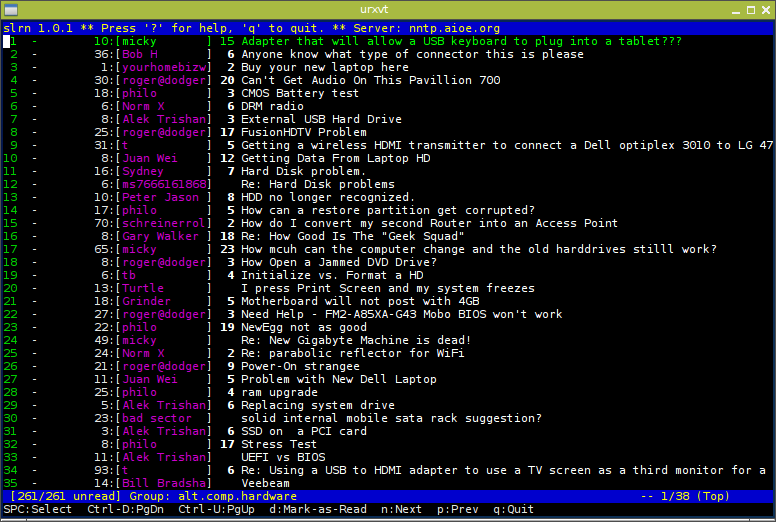 I tried trn from the Debian repositories. 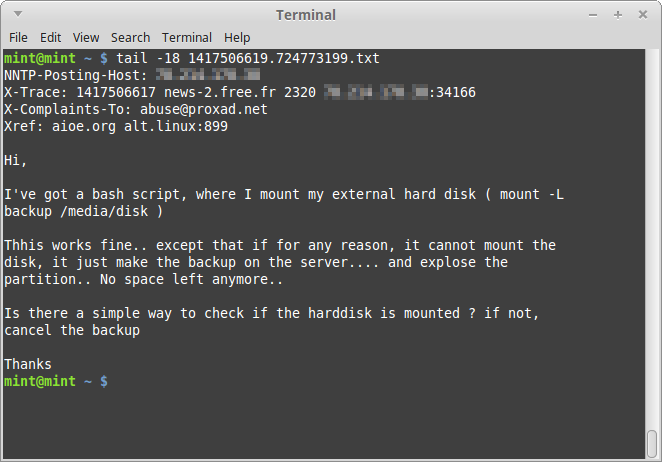 I tried trn4 from the Debian repositories. I transplanted .newsrc files from elsewhere in my system, and elsewhere in the world. Nothing seemed to help. trn claims to be an improvement upon the ancient rn newsreader, but I’m bewildered and discombobulated by this one. By all rights it should work, but it’s seriously playing hardball. I don’t think in this case, as I did with trickle, that the error lies in the program. I’m fairly confident that this is my lack of expertise. Unfortunately now I can’t match it up against slrn or tin, both of which were viable newsreaders. Please blame me. Of course, there’s part of me that says there’s not much “quality” in Usenet news anyway, so I don’t think I’m too disappointed. This entry was posted in Linux and tagged news, reader, usenet on 2014/06/11 by K.Mandla. 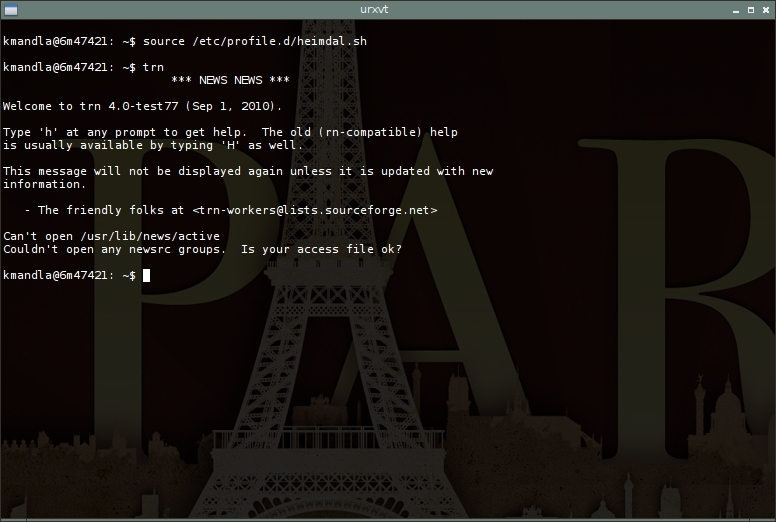 If slrn eludes you, like it did for me for a long time, tin might be a better, easier option. Featurewise, I can’t attest to how they compare; I have very little experience with newsreaders on the whole. I can tell you that both have onboard help pages, both can use color for ease of viewing, and both employ tree structures to show how discussions evolved. 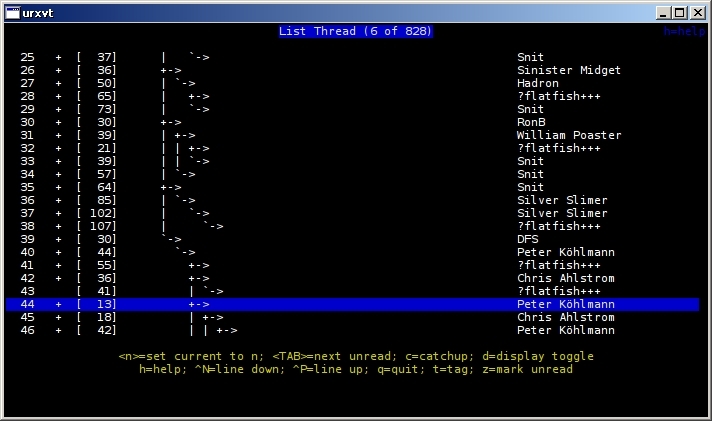 At this early point, the only real benefit I can see of slrn over tin is that the former allows you to see both the tree and the message at once, split-screen style. It may be that tin can do that, and I just haven’t found what button to press yet. Between the two I will probably stick with slrn, only because I’m still learning it and don’t feel comfortable giving up what little ground I’ve gained to learn a new program. Given time I might be willing to jump ship, seeing as tin seems easier to get started, and my newsreading demands are exceptionally light. This entry was posted in Linux and tagged news, reader, usenet on 2014/06/01 by K.Mandla.